The future begins in Quinlan's innovative, sustainable new building. 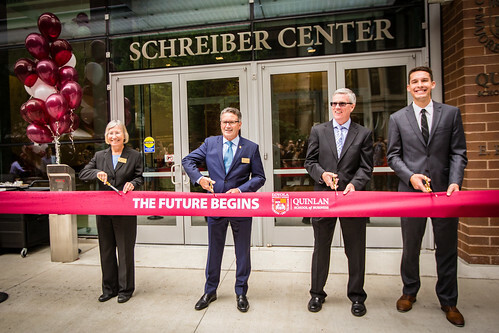 The Loyola community gathered on August 27 to celebrate the Schreiber Center. “This is an exciting day for the University, as we dedicate the state-of-the-art, game-changing Schreiber Center,” said John Pelissero, PhD, Loyola’s interim president. Marketing Department Chair Mary Ann McGrath, business student Peter Hutz, and Sr. Jean Dolores Schmidt, BVM, also spoke at the ceremony. Frank LaRocca, S.J., Quinlan’s assistant dean for international initiatives, performed the building blessing. In addition to members of the Loyola community, the ceremony was attended by members of the Quinlan Dean’s Board of Advisors and The Campaign for Quinlan Leadership Committee, as well as representatives of architectural firm Solomon Cordwell Buenz and Power Construction. View the photo gallery below or on Quinlan’s Flickr page.